Anticipation of the 1931 World Series steadily peaked all summer in the St. Louis area as the Cardinals clinched their fourth National League pennant in mid-September. The Redbirds eventually finished 13 games better than the runner-up New York Giants, but their previous league flags, in 1926, 1928, and 1930, were all secured by meager two-game margins as those campaigns came down to nail-biting conclusions. A rematch against the powerful Philadelphia Athletics, who defeated the Cardinals in the 1930 World Series, along with the promise of hosting the opening game at Sportsman’s Park for the first time helped heighten fans’ eagerness for the calendar to turn to October. While Mack felt good about his hitters, he knew that the key to capturing a best-of-seven series would be his pitching staff. Just before Game One, Mack offered that he did not know yet who would start in the opening game.8 Most notable was Bob “Lefty” Grove, who led the majors by posting a 31-4 mark, with the possibility that George Earnshaw (21-7) or Waite Hoyt (10-5) might get the nod. Grove won two games with a 1.42 ERA in 19 innings in the 1930 World Series, but was actually overshadowed by Earnshaw, who also posted a pair of victories and compiled a 0.72 ERA in 25 innings. Hoyt had been claimed off waivers from Detroit in early July, and came on board with 10 World Series starts on his résumé. Mack ultimately decided on the southpaw Grove to start the first game. Ideal weather greeted the crowd of 38,529, with the high temperature expected to reach 80 degrees. The Sportsman’s Park fans were relatively quiet before they let out a mighty cheer as the Cardinals took the field in their new white uniforms. Underneath the new attire, as tokens of good luck, were the same stained sweatshirts that had not been washed since the season began.11 After the band played the last note of “The Star Spangled Banner,” umpire Klem called “Play Ball” as Philadelphia’s Max Bishop walked to the batter’s box.12 The 1931 World Series was about to begin. Jake Flowers hit for Derringer to open the bottom of the inning and was the victim of a fine defensive play from Dykes at third base for the first out before Grove finished another scoreless half, despite allowing two more hits.16 Syl Johnson took the mound for the Cardinals to start the eighth and worked two perfect innings. Grove retired six of the last seven St. Louis hitters he faced to gain his third career postseason win and give the Athletics an early edge in the World Series. There were no errors, and the contest took one hour and 55 minutes to complete. Simmons and Foxx led the Mackmen as five of Philadelphia’s runs were funneled through their plate appearances. The Cardinals, with Martin going 3-for-4 with a stolen base, tagged Grove for 12 hits, the most safeties the left-hander had ever allowed in World Series action, but St. Louis left nine men on base and finished 2-for-10 with runners in scoring position. Derringer took the loss, and pitched admirably for five of his seven frames. He struck out nine, compared to seven for Grove, but allowed three walks, and six earned runs on 11 hits. In addition to the sources noted in this game account, the author also accessed Retrosheet.org, Baseball-Reference.com, SABR.org, Newspapers.com, and The Sporting News archive via Paper of Record. 1 “Athletics Arrive for First World Series Game Tomorrow,” St. Louis Post-Dispatch, September 30, 1931: 1B. 2 “Major Managers Stick With Their Own Leagues in Series Selections,” The Sporting News, October 1, 1931: 5. 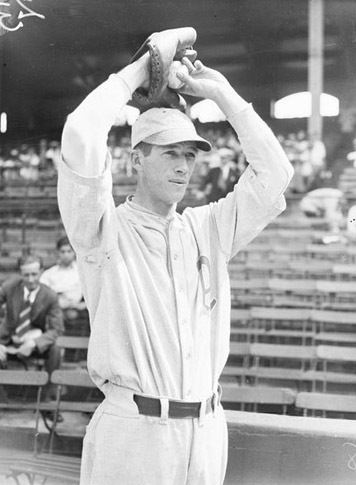 6 Gregory H. Wolf, “Jesse Haines,” SABR BioProject, https://sabr.org/bioproj/person/afeb716c. 7 J. Roy Stockton, “Cardinals in Final Workout Still Hopeful Adams Can Play,” St. Louis Post-Dispatch, September 30, 1931: 1B, 3B. 9 Herman Wecke, “World Series Highlights,” St. Louis Post-Dispatch, October 1, 1931: 1B. 10 E. Roy Alexander, “Cards First on Field; Many in Line at Gates Wait All Night,” St. Louis Post-Dispatch, October 1, 1931: 1B. 13 “The Game, Play-by-Play,” St. Louis Post-Dispatch, October 1, 1931: 1B. 15 William E. Brandt, “Mack Is Cheered by Men’s Batting,” New York Times, October 2, 1931: 20.